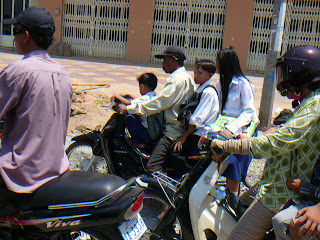 So, over Easter I was in Cambodia. Beautiful country. Now, there is a lot of traffic on the road. A lot. 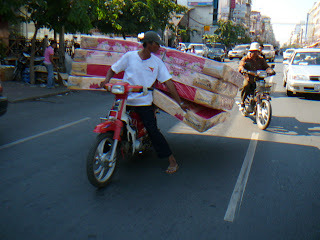 Trucks, cars, tuk-tuks, motor cycles ("motos"), bikes, pedestrians. 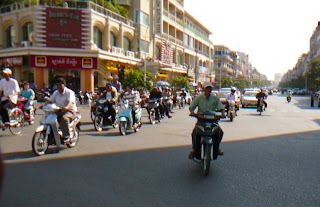 Cairo and Paris are generally known to have the worst traffic in the world, but Phnom Penh competes valiantly. The system used for collision avoidance is the same sophisticated and time-honed system applied in aviation under VFR (visual flight rules): See and avoid. So, traffic lights, lines on the road etc. are considered mere recommendations. The safest way to cross a street is to close your eyes, step on the street and walk at a steady speed on a straight line to wherever you want to go. People will just anticipate that and drive around you. If you commit the beginner's mistake of stopping, looking, or even just hesitating, everyone else will get confused and run into you. In California, the first three steps are generally skipped. 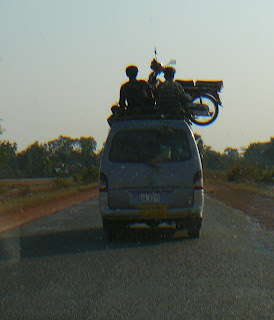 In Cambodia, the fourth one is skipped, too. You just turn, traffic or no traffic. "See and avoid" takes care of the rest. In the picture below, we're turning left through the oncoming traffic. 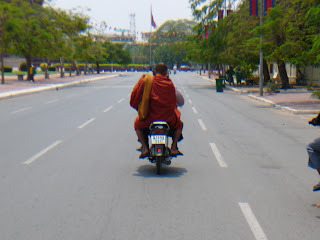 As you can see, the closest moto has already begun to swerve to his left as to avoid us. Most people were wearing a baseball hat for crash protection, so did I. 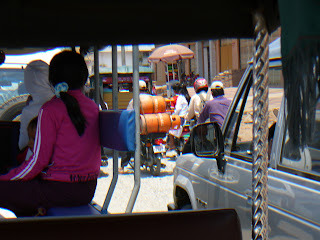 Transport in Cambodia was published on June 10, 2007 .